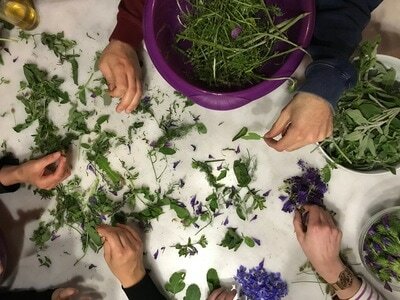 Description: We meet at 9:30 and set out for mount Juktas, where we enjoy a relaxed hike, collecting and tasting edible greens and aromatic plants along our way. After our hike, we drive to the traditional village of Archanes in the foothills of mount Juktas, where we have lunch at a traditional taverna, followed by coffee at a local cafe. 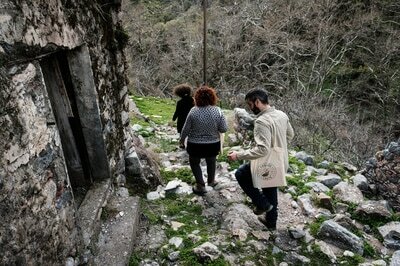 After some free time to walk around the village, we drive back to Heraklion. Expected return time is 17:00. Price: The cost for the trip is €80 per person. Children aged 6-12 pay €55. This includes the guided foraging tour, fresh snacks from foraged greens, as well as lunch and coffee at the village of Archanes. Transport from and back to Heraklion can be provided - please ask us. Description: We meet at 9:30 and set out for Mochos, a lively traditional village approx. 30min drive from Heraklion. On this foraging tour, we will walk down a beautiful path in the country where we will enjoy nature and forage for wild greens (horta) and herbs. The walk will take us through small neighbouring villages. 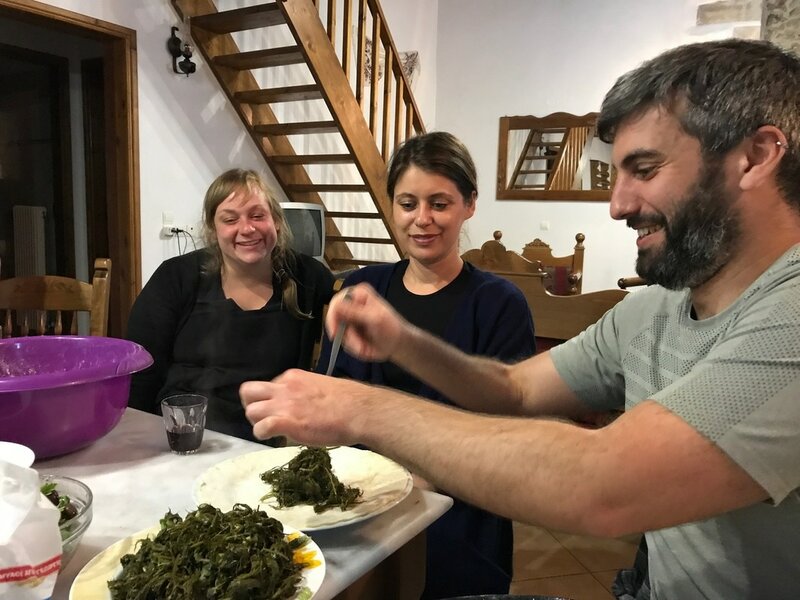 The tour includes tasting of local mezes (traditional tapas style food) in Mochos and surrounding villages during the day. In the afternoon, we will visit a traditional house in Mochos where we will make oil infusions, using organic family-produced olive oil and wild herbs collected on our walk. These oil infusions can be used for cooking and participants can take them home with them. In the evening we will prepare some local food centred around the greens that we have collected during the day. Expected return time is 18:00. Price: The cost for the trip is €80 per person. Children aged 6-12 pay €60. This includes the guided foraging tour, lunch at traditional local restaurants, home-made dinner, drinks and oil infusions that participants can take home with them. 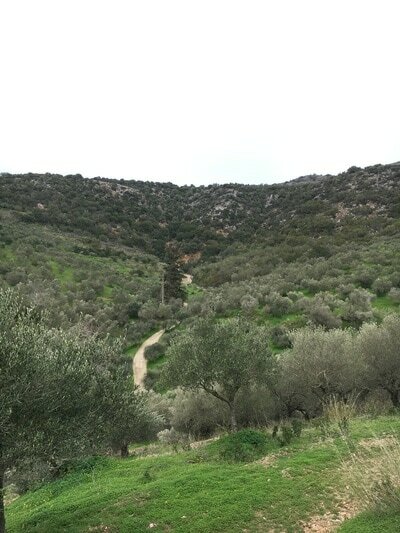 The olive grove: We harvest olives at our organic family owned olive grove outside the village of Potamies, in central Crete. From branch to table: Although large-scale olive harvesting has been modernised in Crete, on our olive harvesting course we follow traditional practices. 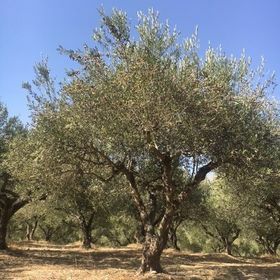 Our equipment includes wooden wands used to shake the olives off the tree, cotton fabric that is placed under the trees to collect the olives, and hessian sacks in which the olives are loaded. Upon arrival, each person is assigned an olive tree and is in charge of harvesting the olives from that tree. Collaboration is, of course, welcome. After harvesting the olive fruits, we sieve them to remove branches and leaves and load them into sacks. We then drive our olive yield to a traditional olive oil mill, where the olives are cold-pressed and we have a chance to observe the pressing process. Although cold-pressing reduces the oil yield, it ensures that the oil is healthier and maintains its aromas and flavours. The oil is divided equally among all participants. 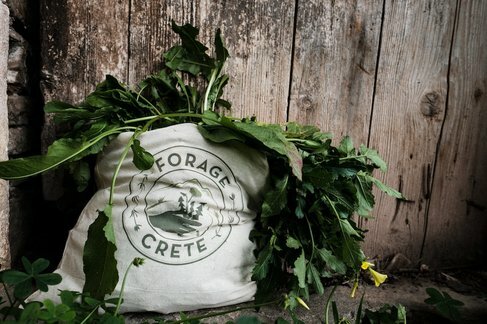 Everyone leaves with a container of cold-pressed virgin olive oil from Crete. 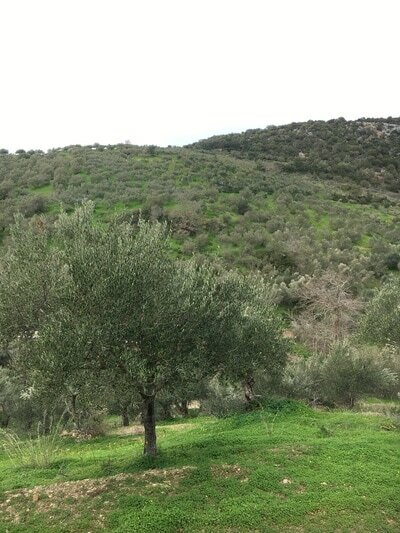 ​​Schedule: We meet at 8:30 and travel to the olive grove. Olive picking lasts until 12:30. We then have lunch at an authentic restaurant in the nearby village of Mochos, a traditional, vibrant village in central Crete, followed by some free time to have a walk around the village. We drive to the olive oil mill at 15:00, leave at 17:30, and aim to be back to Heraklion at 18:30. Price: The cost for the trip is €85 per person (€65 for children aged 6-12). This includes lunch, use of olive picking equipment, the olive oil mill fee, as well as the olive oil that participants can take home with them. Transport from Heraklion to the olive grove and back can be provided - please ask us.